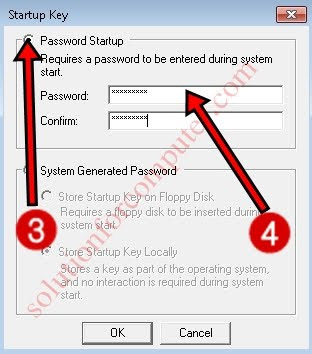 How to set Startup password in Computer. Startup password is also called SYSKEY (SAM lock tool). Syskey is vary important for your computer if you want to make more secure of your computer. Syskey is a in-built utility in windows by Microsoft that's is helps you to make more security for your computer. 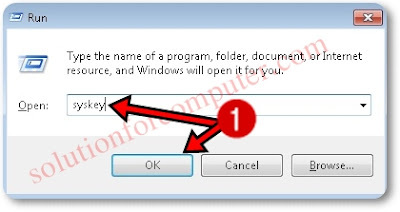 syskey is works all windows like Xp, Windows vista, Windows 7, Windows 8 and windows 10.
there are two option to configure syskey in computer. 2. 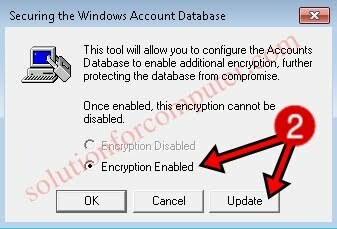 In Securing the Windows Account database box make sure that select Encryption Enabled option. after select a encryption enabled click on Update button. 4. Type password that you want confirm it and press ok button to continue. Note:- If you not set a password so click on system generated password . and select where you want to store password . 5. After that click OK to finish. I hope this post is helps you to secure your computer by startup password. If this post is useful for you and you like this post please share this post with your friend on Facebook, twitter, Google plus and more .Please comment your experience about this post in comment box , and you also follow us by email and other social media .